Shai Reshef founded it in 2009, offering two programs: Computer Science and Business Administration. In the beginning, it was not accredited and it started with 177 students from 49 Countries all over the world. Now, there are students from 180 Countries and it’s currently accredited by the DEAC (Distance Education Accrediting Commission). It’s been seven days since I’ve received the envelope containing my Diploma (Business Administration) from them and all the people around here will remember that moment. After three hours of persistent crying, I applied some ice to my eyes and went to cook for an important event. Probably, that paper melted other sentiments I stored in my heart, that UoPeople relentlessly triggered. I feel happy and sad at the same time. I’ve finished my courses and I have more time availability, without daily schedules and deadlines. No more reading assignments or exams, not even the animated classes where each topic was analyzed and described from the most assorted perspectives I could have ever imagined. No more chats in the morning with peers who were going to bed at the other side of the planet. Together, we shared the same frustration, or sometimes I learned the simple joy of my Latino friend; I picked-up the secret of the commitment of my Cambodian friend, who cleared mines during the day and studied the evening. I burned the midnight oil with my Italian friend, who was always available and loyal, even if we’ve never met. I joined a happy “virtual team” made of two Italians (I and a Fab -guy), a squeaky-clean British girl, an American Lady, a Russian genie and a British/Italian computer scientist&cook. They taught me a lot of English idioms as well as the endless possibilities that true friendship may ever offer. I see a lot of people writing to me and asking for info about UoPeople and the main purpose of this blog is to offer such answers. People want to know about my job, about my life, my family and my future. I ask you a favor: remember that I feel rich, because I’m not wealthy in the sense of money, but my heart and my mind store a unique experience that nothing could ever pay. President Reshef, you created the most powerful, amazing, fair, colored project on earth; I feel blessed and honored to be part of it. A special “thank you” to my Mentor Mindy Chozik and HP for their innovative Mentorship Program. Mindy, my light, my life. A hug to Lily Frusciante, who virtually took my hand and who made me dream thanks to her spellbound worlds. Infinite love to my friend Natascia Tronconi, it’s been 30 years and she’s still there. Thank you to the best teacher ever, William Allman. Thank you to Lorenzo Saporetti, the best Computer Scientist I’ve ever met and the one who made me fall in love with Linux. Thank you to Giovanni Miserocchi, my second brother, the best doctor on earth. Thank you to my family and to my daughter Marta, my heart; she went through my adventure and she’s now proud of me. 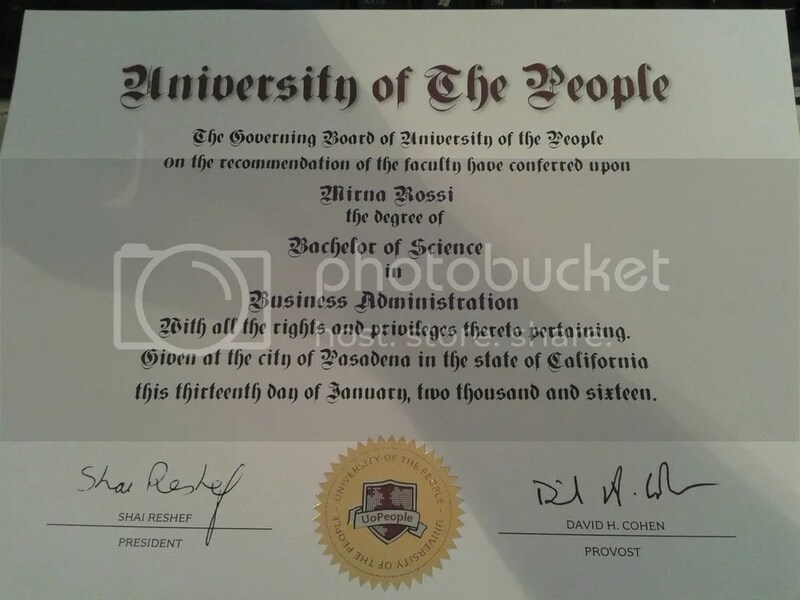 Categories: Articles, University of the People | Tags: HP, hpmentorshipprogram, Shai Reshef, Shaireshef, university of the people, uopeople business administration, uopeople experience, uopeople Italian students, uopeoplealumni, uopeoplediploma, uopeopple graduate | Permalink.